You pay Google for each click. The cost for each click is based on an auction model and in general, the more you’re willing to pay the higher your advertisement is. The cost per click (CPC) varies from industry to industry and is pretty much dictated by the life time value of a customer. Generally, the higher the transaction with the customer, the higher the cost per click will be. Life is about testing and trying out new things and Adwords is no different. If you can see the value of getting infront of customers that are ACTIVELY looking for your type of product / service, then you definitely need to start Adwords and test your market. Testing requires finding out what is going to work however, you will need to go through a process of “buying” in your data. You essentially need to “pay” for the data to find out what will work by spending it on clicks. This is where lots of businesses chicken out, they’re not prepared to fork out money and learn about there business online. Their results are expected immediately or they won’t do it. If it was easy, everyone would be doing it and the CPC would be astronomically high. Fortunately for you, there’s always room for someone to muscle in to gain some market share on Adwords. If you’re going to do it, do it NOW as Adwords is ONLY going to get more expensive. Trying something new is one thing but trying it for the right length of time is another, which means your testing needs structure. There’s no point trying an idea for only 10 clicks then jumping on to the next opportunity because it failed. Your better off sending 200-300 clicks to one page on your website with laser focus and then analyse the facts. By this stage you will have paid for a good amount of clicks to analyse and be able to make great marketing decisions. You test until it works. PERIOD. “How much will that cost” I hear you say? To answer the question, you will need to use Keyword Planner from Google, find the rough cost per click and then multiply that cost per click (cpc) by 100 or 200. If we’re testing 200 clicks at $0.50 a click, it would cost you $100. Buy that amount of clicks and hopefully you have a good product / service, you would have gotten some sales and phone calls from customers. This would be your 1st phase test. 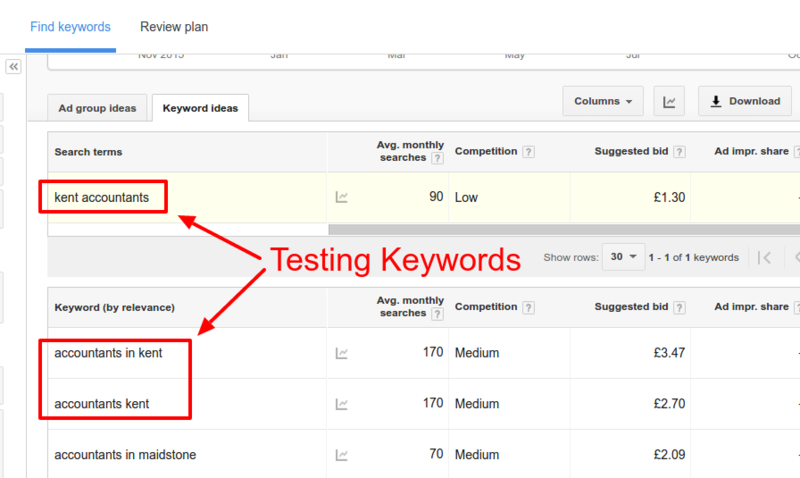 When you look at your stats in the Adwords interface along with your Google Analytics for tracking stats, you can then decide what factors you want to optimize for Phase 2 of the test. Ensure keywords are in your headlines of your ad so that it matches your customers search intent. The Ad will stand out as it will match your customer’s decision making process. Test different headlines to see which one gets the most clicks. A great headline will then lead the customer to read the description. 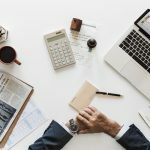 This is where you will be telling the customer what is unique about your business and why they should be contacting you. In your ad description, you will want to talk about the benefits and features of your business then add a call to action like “Get a Quote”. Assuming your headline is great, with a great ad description, you will expect a click to your website. In fact, you’ll get a click even if your ad is bad (you’ll just end up paying more). You obviously need to use the right keywords for your business to get in front of the right customers but when adding keywords you 100% need to input it correctly or you WILL end up losing money even though you “thought” you added the keywords correctly. This is probably the number 1 reason why most of the customer quit, because they messed up this bit. Before you go onto advance keyword targeting, our suggestion would be to input the keywords with square brackets. 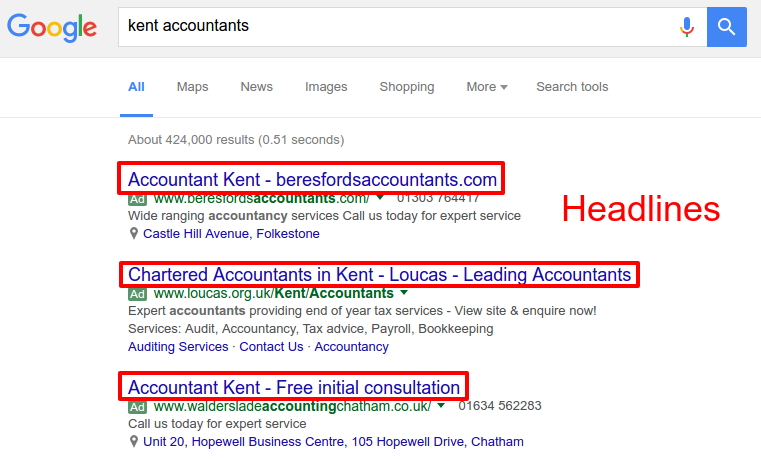 Eg if the keyword is: “kent accountants”, you will type into the keywords area with the square brackets [kent accountants]. You won’t get as much clicks as other methods but its as targeted you can get and will at least start you on your Adwords journey. As your account develops and you know more about keywords, you can start expanding to reach more customers. Depending on your business, you will be measuring the success in a number a ways but I know your end goal is to get either a website sale or a phone enquiry/email from a customer. Right? When you test the above, your conversions will naturally develop. This then comes down to tracking. 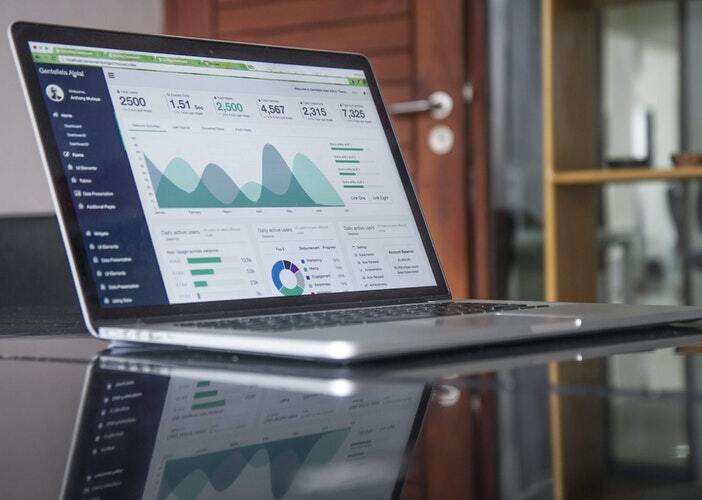 Your tracking can be the sales reports from Google Analytics & sales generated, it can be the Google Adwords conversions found in the backend of Adwords interface or it can be simply be the amount of times your phone rings (not ideal if not tracked). Where you will lose money or gain customers is through the right keywords. We’re not so worried about the headline and the description as you will most likely write naturally for that but where it ask you add keywords, this is where most mess it up because they don’t understand keyword match types. Adwords is easy but at the same time complex if you don’t understand the foundations of the system which is why some have lost money and some are raking in new clients and sales. I met a customer a few days a go where we’ve set up his account and now he generates bread and butter clients consistently. If you’ve found this useful, you might find my 10 Page Adwords Common Mistakes Guide useful. Michael Nguyen was a late blooming entreprenuer at the age of 20 and has been in digital marketing since 2009. In 2012 he decided to explore freelancing and started working with customers directly to help them win online. 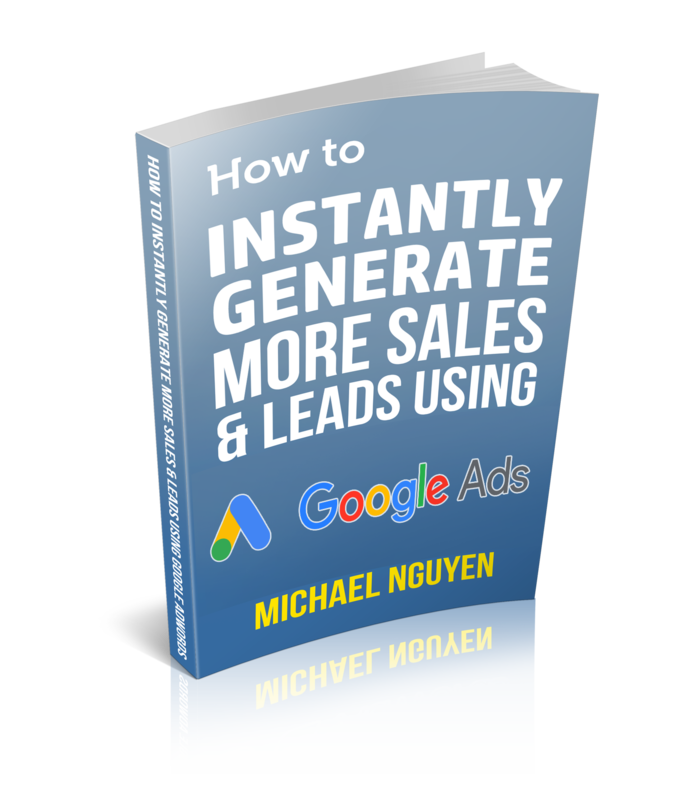 Michael believes that marketing has to be 100% accountable, transparent and has been producing exceptional results with Adwords PPC. 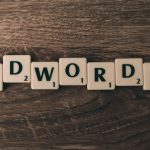 Download the Adwords Guide which reveal the Adwords Keywords Mistake that is costing business owners money.